The headline says it all. Andy Machals and his team have finished their translation of The Two Towers' Annotated Score. See the finished product right here, or browse the full website yourself. That's "still" as in "I'm continuing to work," not "Motionless at work"... though the latter is more accurate as it pertains to emails and posts in the past few days. For that I apologize. Anyone waiting on correspondence: I promise I'll get back to you soon! Editing is going incredibly--if exhaustingly--well. I expect a locked text within days. 33 gigs of image files are arriving around the end of the week, so that should pretty well inaugurate the layout phase. Regular updates and email responses will likely resume around the same time. In the meantime, I'm going to try and squeeze in a few hours of sleep! A very brief book update before I tumble into bed: I'm leaving town tomorrow night to tend to the tail end of the proofreading process. We should have a locked first draft of the text by the end of the weekend. Next week begins the layout phase. Anyway, posts/emails may be slow in the next day or two. 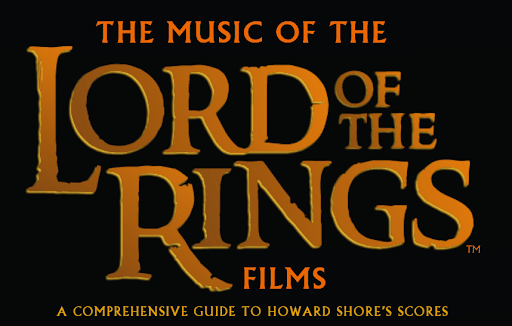 Over the past few weeks--months even--there's been a lot of speculation, both here and elsewhere, about just what a potential "deluxe" version of The Music of the Lord of the Rings Films could/should offer. If you'll indulge me, I'd like to add my thoughts/rational to the mix. 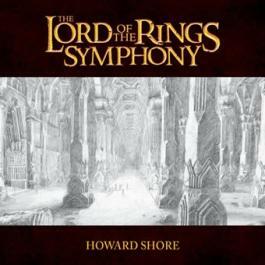 This book was originally designed with a twofold purpose: One, to examine the creation of Howard Shore's score to The Lord of the Rings and two) to explain its function. Why? Because I believe it's a work of art. I could go into it's utter uniqueness, or into film music's longstanding status as a misunderstood art form, but that's really superfluous. I mean, a excellent tome on Beethoven's Seventh would be absolutely welcome... or Britten's Peter Grimes... or Piccasso's blue period. But it's not as if Classical period symphonies, British operas or Twentieth Century Spanish painting have been marginalized. Shore's work here deserves our concentration simply because it is good. That's enough. And in fact, I so ardently believe that Shore's score merits examination that I've allowed large sections of my book to be released well before it officially goes to print. You know these excerpts as the liner notes to The Complete Recordings and The Annotated Scores. The book expands both these sections and adds chapters on the score's creation and recording and The Rarities Archives, so it certainly has reason to exist. But that's neither here nor there. My point is this: I want people to understand this amazing music. Inside and out. Backwards and forwards. This is why it is of upmost importance to me that the content of both the standard and deluxe editions of this book be identical. This music has an incredible following. I've seen it first hand. Children love it. Adults love it. Families. Musicians. Film fanatics. Film score aficionados. Tolkien nuts. Concertgoers. I want these people--ALL these people--to appreciate Shore's work upon the same lofty plane as it was conceived. I do not want any information reserved solely for those with deeper pockets. Such an act inevitably implies a politicization of the arts and, if you'll excuse a momentary lapse into proselytizing, this is something with which I'm simply not comfortable. That does not, however, mean I have anything against the concept of a deluxe edition. I just dislike the idea of deluxe information, per se. I know that collectibility is a fun and weighty buzzword to all the groups listed above. And heck, let's throw bibliophiles into the mix while we're at it... this is their bread and butter! So hardcovers, numbered editions, multiple signatories... these are things that I AM comfortable with. Entirely and enthusiastically so, in fact! I don't want to give away any plans--some of which are still very much in the works--but these are what we're looking at when we bandy about terms like "deluxe." Yes, I know I'm taking this all far too seriously. But what can I say? These delineations are important to me. I simply don't feel right telling one family they can learn about additional thematic material while telling another they cannot because of financial concerns. "Deluxe" is a term I'm only comfortable applying to luxury items, not information. Again, this doesn't mean I have anything against it, or that I plan to create a deluxe edition that's anything less than incredibly fun, interesting and worthy of the investment. I just want to make sure I can live with myself in the morning, if you take my meaning. Public Radio International has a nice piece on The Fly here. Glad to see the coverage slowly turning from hype- and celebrity-based journalism to an intelligent discussion of the content. It hasn't completely turned the corner, but it is improving. Thanks to Marilynn Miller for the heads-up. 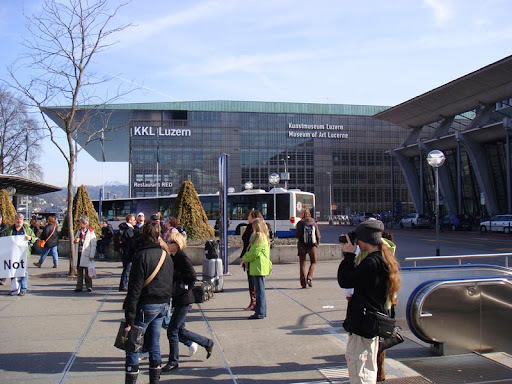 It seems a long time off, but start booking those plains, trains and automobiles now: TTT Live is officially set for March, 2009, performed by the 21st Century Orchestra and Chorus at the KKL in Lucerne, Switzerland. Believe me, having both missed and attended performances in Lucerne, I can only recommend the latter! This blog has popped up on a couple of radars this week, so I thought I'd return the favor. Check out TheOneRing.net's coverage here, and Kristin Thompson's coverage here. Tickets to the Los Angeles Opera's production of Howard Shore's The Fly are now on sale. Click here, or see the link near the bottom of the right sidebar. I will most likely attend the performance on September 7. Anyone in the neighborhood, please feel free to say hello. I'm generally not a big fan of the number-crunching side of the arts: How much did this production cost? How much did it make? Who gets what off the first 10% of ticket sales? Certainly these stats are a reality of any production, but audiences' preoccupation with dollar signs gets a little silly after a while... as if these numbers have anything to do with the resultant artistry. Nevertheless, I found this info on US government grants awarded to opera productions to be interesting if only because you can see the relative amounts awarded to various productions. John Adams' A Flowering Tree gathered a just bit less that Shore's The Fly. But both were dwarfed by a Lyric Opera production of Gershwin's Porgy and Bess. Of course, nothing here indicates what the total budgets were, just the grants themselves. At the very least, it's a wonderful reminder that government programs still help support the fine arts. Speaking of The Fly, we should have a review up shortly... hopefully in the next day or two. 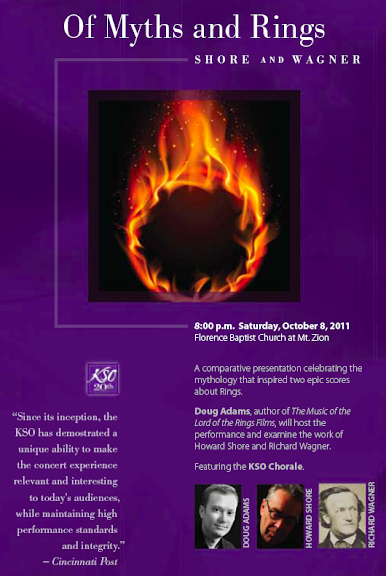 St. Louis has a short blurb on the upcoming LOTR Symphony performances on their webpage today. Check it out here. I also got an email this morning regarding a blog that has listed upcoming performances of the Symphony in Tampere, Finland. The blog in question hosted a number of illegal MP3s, so I won't provide a link. But I can confirm that, yes, there are currently plans to being the Symphony to Tampere! The above is the current word count for The Music of the Lord of the Rings Films. The book will rest comfortably at this number for the time being--it is now officially out for proofreading and the text is locked until the tweaking begins. Funnily, it currently feels just just another document cleared off the desktop. Of course, I think the import will sink in later. So right now... it's Miller time! John Jennette's ambitious project began as school assignment, but has turned in to a really uniquely interactive way of experiencing the online Annotated Scores. Click the logo below, and give it a try. Just about to ship out of Los Angeles, but before I pack up the laptop, I thought I'd try to illuminate some of the details from this week's meetings. As ever, everything is subject to change until it's done and in your hands... but I think you guys know that routine by now. We're still right on schedule for a fourth quarter 2008 release. I will deliver the locked text by the end of July. The publishers (who will still remain nameless until we're ready for press releases) have been incredibly flexible in terms of length and layout. Right now, we're aiming to keep the finished book at or under 200 pages. This means that, unless the final layout wildly rearranges the material, nothing will have to be cut from the current draft. That's amazing, and almost unheard of. I'm tremendously grateful to be working with people that understand that the audience for this book doesn't want a watered down, well-pruned bit of fluff. I will finish up the supplementary material with Shore in NY in early to mid August. That will be locked shortly thereafter. We're most likely looking at a single double-sided DVD. That will store everything we need without compression and keep the final price tag down. DVD authoring will begin after the materials are locked, of course. I'm happy to announce that, after years of your suggestions to produce "normal" and "deluxe" versions of the book, we're now actively exploring that possibility. See, we do listen to you! So what's the next step? Well, next I have to get on this plane, make my way back my office and get back to work! Oh, and for those of you interested in such things here's an updated look at the book's mocked-up layout. Same disclaimers apply as last time... and again, mind your eyesight! It's interesting watching the press try to grapple with The Fly. Critics are notoriously tough on new operas, so I pretty well expected them to head in with nails sharpened, teeth bared. And while some of the obligatory low-level grumbling has been present, in the main it seems like first audiences are still absorbing the piece, still sorting it through in their minds. 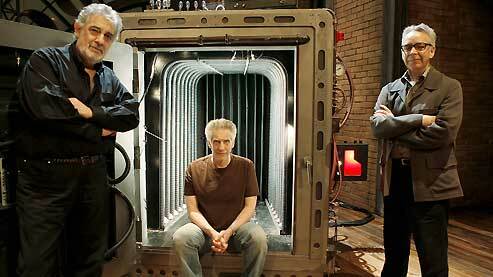 Both Cronenberg and Shore have brought something to the opera world that has upset its linear hegemony here. They have such strongly individual aesthetics that writers are unable to fall back on their critical cushions and toss about cliches to pigeonhole this as a progeny of the Italian school, or the German school. The score employs an advanced tonality that is largely of Shore's invention-- a system of chromatic tonality that's built off a flexible consideration of intervalic relationships, but which is, again, not slaved to any pre-existing school of thought. (Shame on Renaud Machart in Le Monde who attempted to peg Shore as a disciple of Shoenberg, which is inaccurate both stylistically and technically.) And bring up Cronenberg and you're sure to hear "body horror" mentioned in short order, because there's at least a filmic heritage there, even if it's entirely of Cronenberg's creation. But again, it doesn't fall in line with a particular opera camp, and it's giving them fits. I'm not defending the The Fly against any sort of negative press, I'm simply decrying the lack of thoughtful press, positive or negative. Well, maybe not "decrying"... Maybe "lamenting." This is a thoroughly evocative and engaging piece, but it simply has to be encountered on its own terms. This isn't the Howard Shore of The Lord of the Rings, or The Aviator, or Silence of the Lambs. This isn't the Cronenberg of Videodrome, or M Butterfly, or A History of Violence. And really, this isn't the Shore/Cronenberg collaboration of the 1984 film The Fly. The effectiveness of this piece should be based on neither the prior works of its creators nor the norms of the opera world. This this The Fly, an opera of 2008. Let it soar or sink by its own merits. In all honestly, however, I suppose it's not too surprising to find the press fumbling with the premiere just out of the gate. 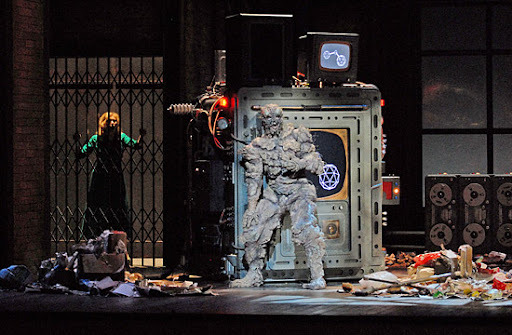 The Fly is not exactly an operatic bon-bon. It simply may be that this grizzly feast takes a while to digest. And that is not a bad thing. I'm creating this post in the hope that readers can post links to whatever thoughtful reviews/press coverage they find out there. (I thought this piece in the International Herald Tribune was, if not entirely probing, at least pretty thorough in its coverage.) And, of course, the handful of you that will actually attend the Paris performances are more than welcome to post your own thoughts. Be brave. Be very brave! 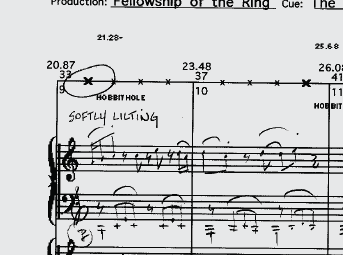 It's funny, I constantly feel the need to apologize for covering The Fly on a Music of LOTR blog, but let's face it: Shore departed Middle-earth to work on this opera, and he'll be returning to The Hobbit shortly after its debut. His work on The Fly likely has had and will have a great influence on his Rings music. Perhaps not in style or technique, but in the kind of gestures and drama that he'll wield. It's an interesting relationship--though I guess I'm leaning on the same sort of fabricated lineage that I'm grumbling about above to justify myself. Ah well! In the end, The Fly is a stunning piece from a composer we're all interested in, so perhaps that's justification enough. This would be the first I've heard of it, but this piece in The National states that the LOTR Symphony is on the agenda at the upcoming Abu Dhabi Classics festival. It also states that Shore, himself, will be in attendance. When and if I hear more, I'll be sure to update. 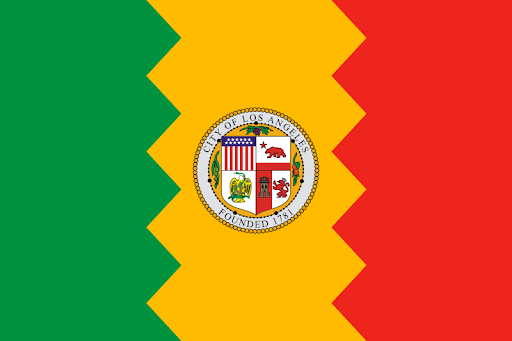 Hello one and all from Los Angeles, California. I'm just back from meetings with the Music of LOTR book's publishers, which were tremendously productive, I'm happy to say. I'll have additional details when the schedule slows, but know that, at the moment, things are looking very, very good! I'll be thrilled if anyone gets the headline! 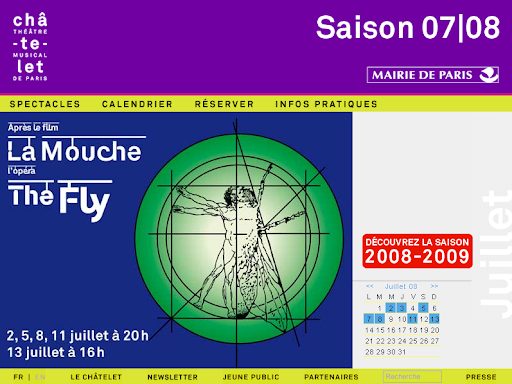 Just checking in quickly to remind all of you that the world premiere of Howard Shore's opera, The Fly, will be tomorrow at the Théâtre du Châtelet in Paris, France. This is a major effort from Shore, and it's a heartbreakingly beautiful and intensely smart piece. But don't take my word for it--we should have reports coming in soon. If I weren't tending to the book this week, I'd be there myself. I do plan to be in LA in September for the first US performances, however. Ok, now I've got to fly... See you soon. It is now July first, and as I write this I'm stuffing belongings into suitcases, preparing to fly to Los Angeles and meet with the book's publishers. As I do so, I'm reminded of one of my first LOTR-related trips: my voyage to the London-based recording sessions for The Return of the King. Seems a long time ago now. Soon after returning, I wrote up my recollections for Film Score Monthly Magazine. I'm not sure how much of the blog's current readership was following events back then, so I've scanned the article for your viewing pleasure. Please see the slideshow at right and click to enlarge each page, or simply click here, if you wish, for the album. 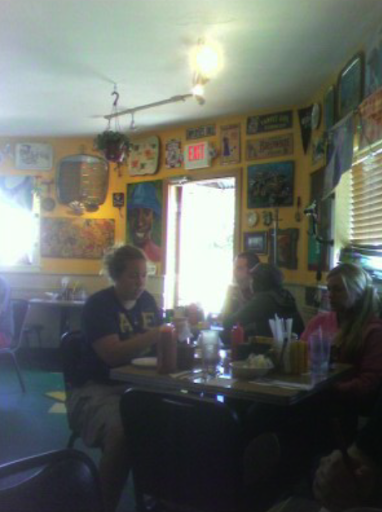 You'll probably need to zoom in a bit... but I promise this time the resolution will actually withstand your scrutiny. Ok, back to cramming my socks into bags! Enjoy the new comment board below. I'll likely write next from the West Coast.